Li Xiaohu’d like to call it ‘hiking’ rather than ‘trekking’, although we really suffered from jet lag after a long journey from Asia to West Coast, to Arizona. After sleeping from 5PM to 6AM (local time, why we spent over 12 hours sleeping? 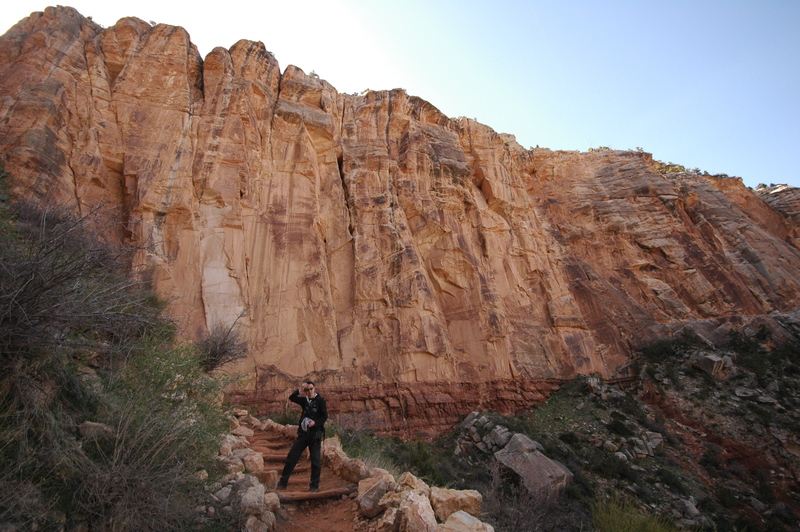 ?>_<), we went for sunrise, and then, started hiking along the Bright Angel Trail. Among all the places we have been for hiking, Mt. Annapurna was the most pleasant experience with a rapid change of scenery: farmland, Hindu temple, waterfall, jungle, snow mountain, vibrant sunset and bright clouds. On the other hand, Mt. Meili was a isolated, mysterious world where the basement had been abandoned for ages and all the tracks and paths were hidden under snow. When we climbed over the mountain ridge on the way back to the village, we heard a snow slide. 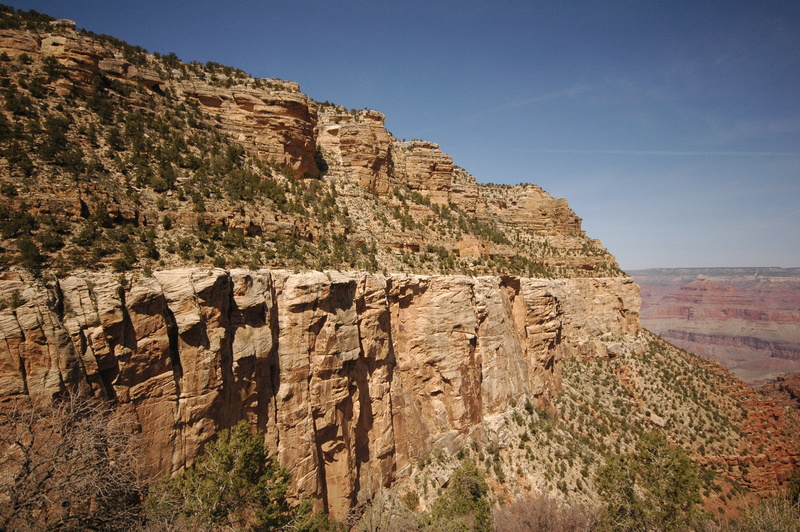 But hiking in the Grand Canyon was more like wandering in our own backyard – well, without the ambition to hike down to the campground at the bottom. First of all, tons of information were available on the internet. 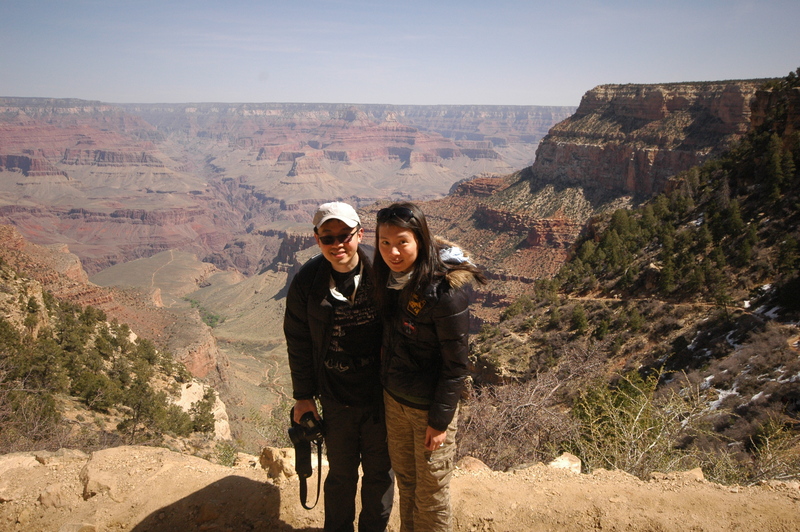 Before departing from Hong Kong, we were aware of the three premier trails in Grand Canyon. 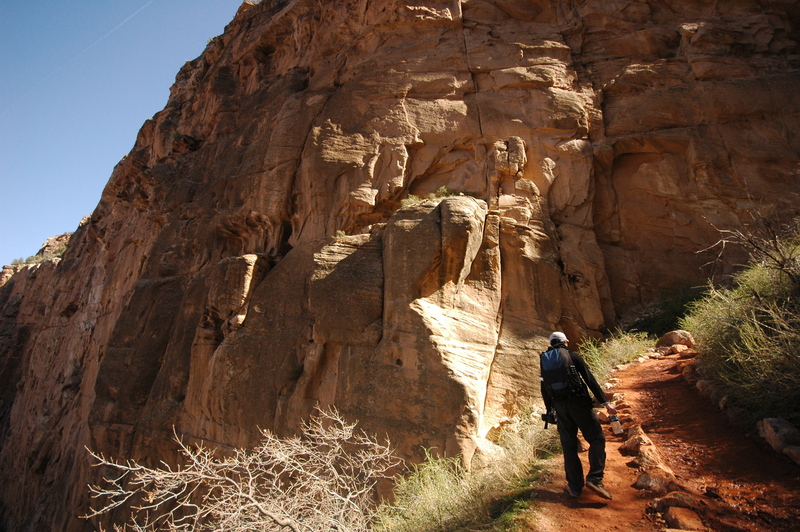 I was attracted by the South Kaibab trail, but for certain reason (??) 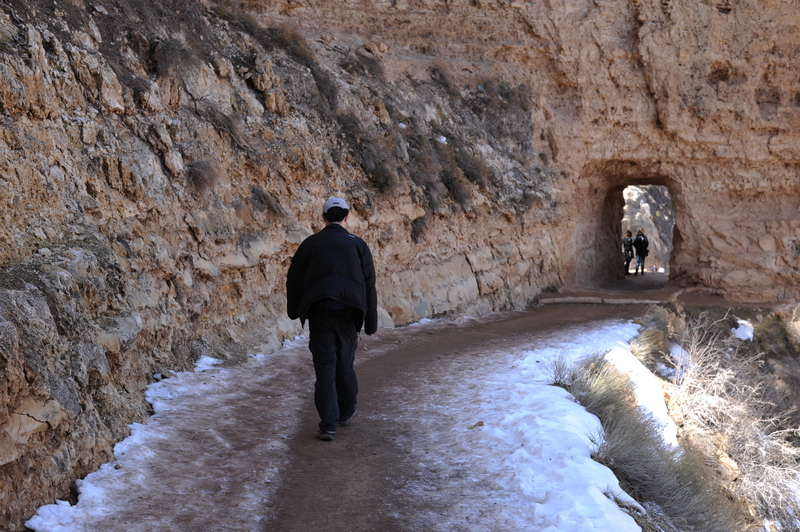 Chen Tu liked the Bright Angel Trail better. Now he was hiking on the icy trail, carrying the big camera bag covered by his down jacket. ‘Like a camel’. It was the end of March, the season for flower blossom in Hong Kong. Here, one side of the trail was exposed to the sun and easy to walk. Another side in the shade, where ice was melting, was very slippery. Some rocks have holes in them. People really enjoyed taking photos through these holes. There were many tourists walking along the trail. Luckily we met a pair of mom and daughter, who took photo for us. 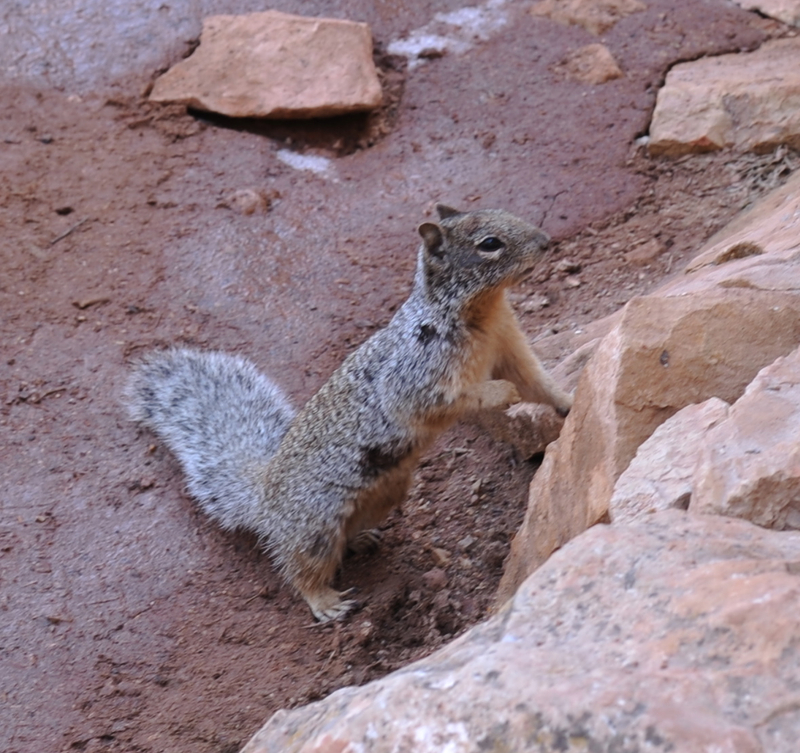 Rock squirrels were everywhere, however, unfortunately, not welcomed in Grand Canyon. Hahaha, these cute, furry animals bite. Every year some people have been bitten. We had to enjoy this little rock squirrel from a distance. The temperature changed dramatically when we walked down. We set off in the Winter. At the three mile rest house, It was almost in the Spring. We overlooked the green forest at Indian garden. Some girls just wore tank tops and long shorts, comparing to our heavy, black, down jackets….. It was still very dry, but was painted green, with growing bush. Some helicopters passed by and left white smoke lines in the sky.